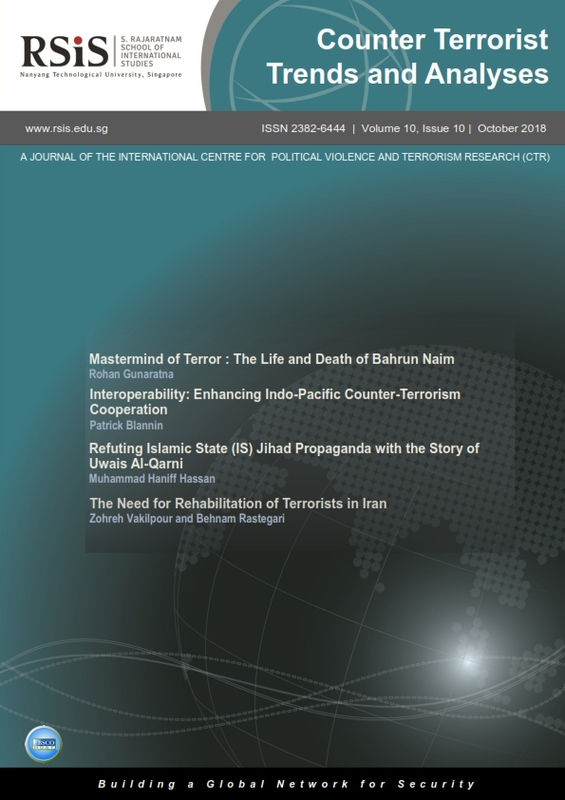 The October issue observes different dynamics of responses to terrorism, in terms of observing case studies, deconstructing methods and improving mechanisms to deal with the evolving threat. The articles focus on key aspects of counter-terrorism – through transnational cooperation and specifically interoperability, countering violent extremism – through counter-ideology and rehabilitation. Overall, while there is no ‘one size fits all’ approach to fight terrorism, there is a need to holistically incorporate diverse approaches that both counter terrorism and counter violent extremism in order to witness tangible and measurable gains. In the lead article, Rohan Gunaratna discusses the circumstances surrounding the death of Bahrun Naim, the effects on the threat landscape in Indonesia and lessons for effective counter-terrorism. Bahrun Naim’s links to the Islamic State (IS) and ability to radicalise and recruit supporters in Southeast Asia until his death, while operating from Syria, highlights the success of social media propaganda and outreach. The article also focuses on his recruitment tactics and network base that enabled him to plan multiple terrorist attacks, highlighting the need for long-term collaboration, cooperation and information sharing between security agencies within and beyond the Southeast Asian region. Next, Patrick Blannin discusses cooperation within the Indo-Pacific region as a key aspect of counter-terrorism efforts. The author puts forward the concept of interoperability, in which two or more states act in a coordinated manner to address a common problem. This will facilitate the translation of policy-making rhetoric into operational responses to security threats. It is argued that improved interoperability will enhance regional counter-terrorism cooperation at the strategic and tactical levels. Muhammad Haniff Hassan delves into the counter-ideology domain and attempts to refute IS’ claims on jihad as a personal obligation where the consent of parents is not necessary. The author analyses the IS’ argument and counters it with the historical story of Uwais Al-Qarni, who did not participate in jihad or migrate to Medina because he was taking care of his sick mother. The author contends that use of historical Islamic examples can assist in countering IS’ extremist arguments that are intended to reduce barriers to engaging in violence. This story can then also be useful in countering the extremist thoughts of groups such as Al-Qaeda and Jemaah Islamiyah (JI). Lastly, Zohreh Vakilpour and Behnam Rastegari focus on the need for a rehabilitation programme in Iran for terrorists, specifically with the rise of the Islamist extremist threat since 2017. The authors state that while Iran has a rehabilitation programme for non-terrorist offenders, it remains limited in terms of legislation on its methods, scope and implementation. This requires improving the existing rehabilitation programme while using the relatively successful rehabilitation programmes for terrorists in countries such as Singapore and Sri Lanka as models for Iran.